Almost every morning when my younger son leaves for school, he will say to me, if Catharine (our breeder) emails and sends more photos, text me right away. He’s not supposed to have access to his phone during school hours, but he sometimes manages to sneak a text and ask if I received any new puppy pics. 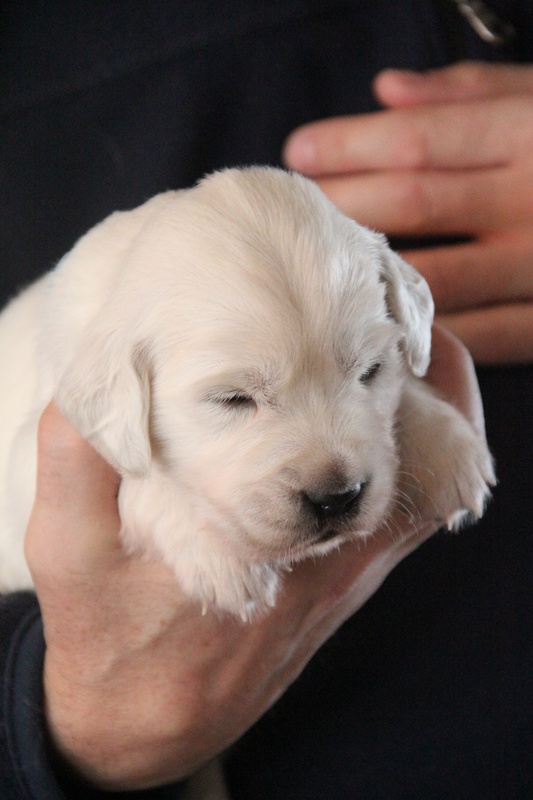 We eagerly awaited for the pups to turn 3 weeks old! 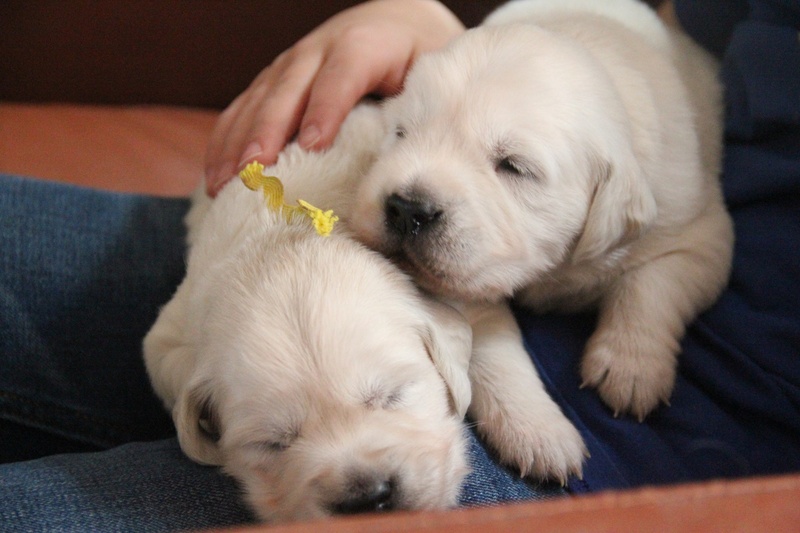 Because that’s when we could finally go back to Braefield to meet and hold the pups for the first time. When we arrived, another family and two couples were already in the doggie-bedroom. All it took was one look around, and I knew everyone was in love with the pups. The pups were beyond adorable. They were barely awake and hardly did anything, but they were so darn sweet and cuddly. We were encouraged to grab and hold a puppy, and to share and pass them around. 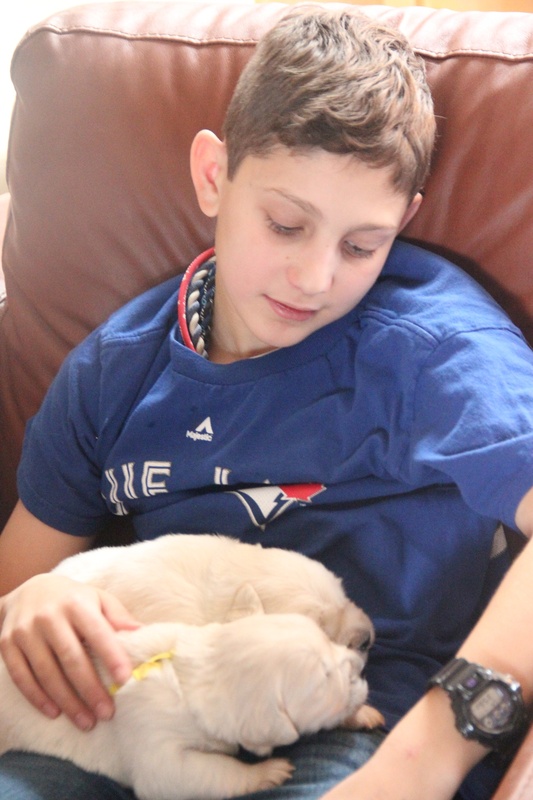 At first, my older son was nervous to hold a pup as it was quite squirmy and he quickly handed the pup to me. He eventually got comfortable and held a pup the whole time we were there. He fell in love with Mr. Black. 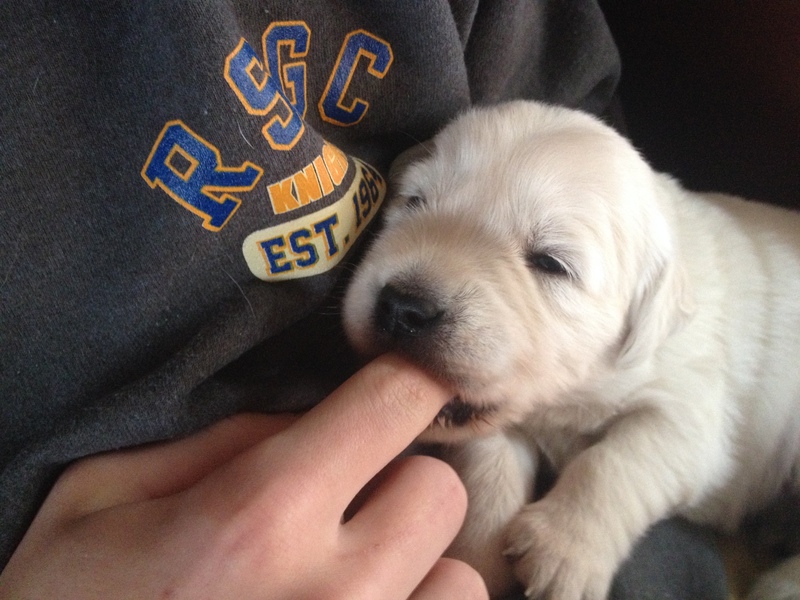 Mr. Black chewing on my son’s finger. I took hold of a pup and immediately began to rock back and forth. The instinctive “rocking-mom stance” came back to me. It was like holding a newborn. My husband’s pup started to whimper and mama Flora came marching over to find out why her pup was upset. That was pretty amazing. 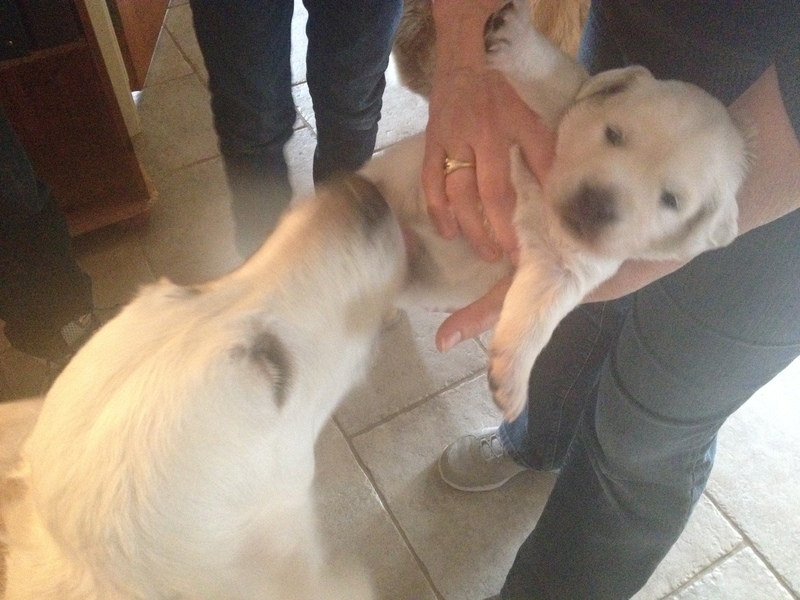 Flora began to vigorously clean (lick) the pup and the pup settled. Mom knows best! Mama Flora taking care of her pup. My youngest took to the pups like he’s done this every single day of his life. He fell in love with Mr. Yellow and at one point had two pups in his lap. Adorable! M loving TWO puppies. But we’re only taking one. Photo courtesy of Braefield. It was great to meet and chat with the other families that will also take a pup home. I already planted the seed for a puppy play-date over the summer with one family, who doesn’t live very far from us, and a young couple, who does live far from us but said they’d come too! Our visit was full of aww-moments, but we quickly realized we had a lot to do before our pup comes home. Catharine asked if we had vets picked out. We don’t, so I need to get that figured out. Then her husband Grant asked if we had names yet. Ahhh, the great name-debate! Stay tuned for that story. We reluctantly left after our two-hour visit with a to-do list, and already thinking about our next visit in 3 weeks time. The pups will be completely different by then. They’ll be bigger and more active. My younger son made a count-down calendar. 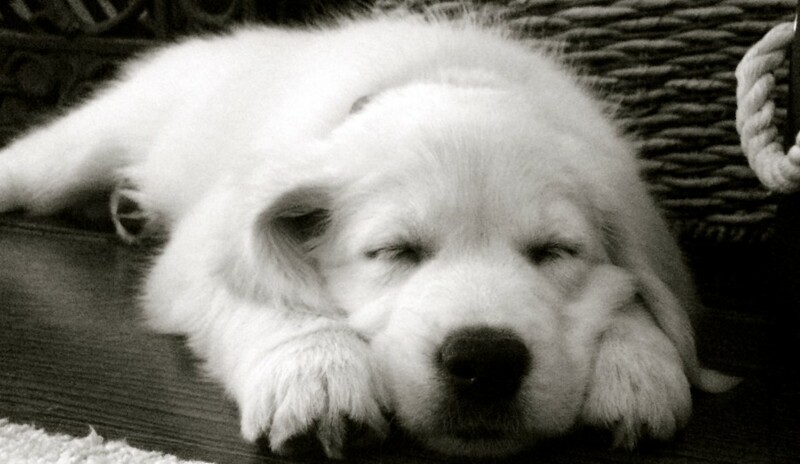 And his daily reminder to me for an immediate text should new puppy photos land in my in-box, continues. Next > What’s in a Name? Why baseball of course!